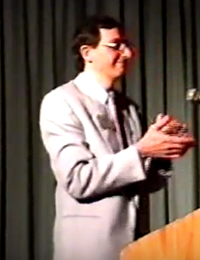 On May 8, 1993, Freedom Party kicked off its May 9, 1993 political workshop with its “Reflections ’92’93” dinner: a retrospective on Freedom Party of Ontario’s recent political activities. Freedom 200 pins were awarded to the following attendees of the dinner: Joe Byway, Kathy Byway, Carol Fitzgerald, Kim Malcolm, Trudy Moody, Carol Ranzan, Conrad Ranzan, Silvio Ursomarzo, Carol Vandenberg, and Nick Whitehead. Titled “Horizons”, the workshop was led by Freedom Party of Ontario president Robert Metz. It dealt with abstractions vs. concretes, with the definitions of key terms (e.g., government), and with issues raised by attendees.